The Coco de Mer belongs to the Coryphoidae subfamily and tribe Borasseae. Borasseae is represented by four genera in Madagascar and one in Seychelles out of the seven worldwide. They are distributed on the coastlands surrounding the Indian ocean and the existing islands within. 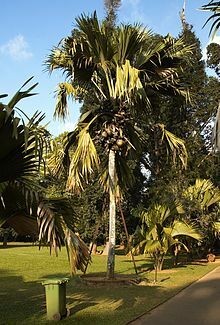 Borassus, the genus closest to Lodoicea, has about five species in the “old world,” one species in Africa, one in India, South-East Asia and Malaysia, one in New Guinea and two species in Madagascar. The tree grows to 25–34 m tall. The leaves are fan-shaped, 7–10 m long and 4.5 m wide with a 4 m petiole. It is dioecious, with separate male and female plants. The male flowers are catkin-like, up to 1 m long. 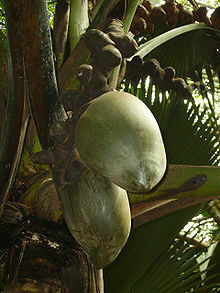 The mature fruit is 40–50 cm in diameter and weighs 15–30 kg, and contains the largest seed in the plant kingdom. The fruit, which requires 6–7 years to mature and a further two years to germinate, is sometimes also referred to as the Sea Coconut, Bum Seed, double coconut, coco fesse, or Seychelles Nut. The Coco de Mer is the most interesting species of the six monospecific endemic palms in Seychelles since it is the “only true case of island gigantism among Seychelles flowering plants, a unique feature of Seychelles vegetation”. It is one of the most universally well-known plants and holds three botanical records; the largest fruit so far recorded weighed 42 kg; the mature seeds weighing up to 17.6 kg are the world’s heaviest and the female flowers are the largest of any palm.